I hope everyone had a great Thanksgiving holiday! If by great, I mean stuffing myself with lots of turkey, gravy, potatoes and stuffing, then yes, I had a great one too! If by great, I mean playing lots of card games with Michael, going to the movies with kids, and putting up the Christmas lights and tree, then yes, I had a great one too! I’m very happy though that I can finally focus on Christmas without any ridicule! And I’m talking ridicule from my husband, in case you were wondering…. I went to Costco this month for my regular shopping trip. You know, to restock on sugar, flour, oil, toilet paper…all that good stuff! I spend a lot of time just wandering too. And in my wandering in the bakery section, they had tubs of salted caramel bark. So of course I looked at it and thought to myself, “Self, there is no way I am buying this when it looks so easy to make”! See that’s the trouble with recipe developing. You don’t like taking the easy route. Are you all with me on that? Since I started food blogging this year, I have a hard time buying a cake, spending money on cookies, and eating out. Now, that’s not to say I don’t enjoy those things, I just have a hard time doing it! I say that because I just ripped open a package of NutterButter cookies today and I’m okay with it. But, not taking the easy route doesn’t mean recipe developing should be hard. 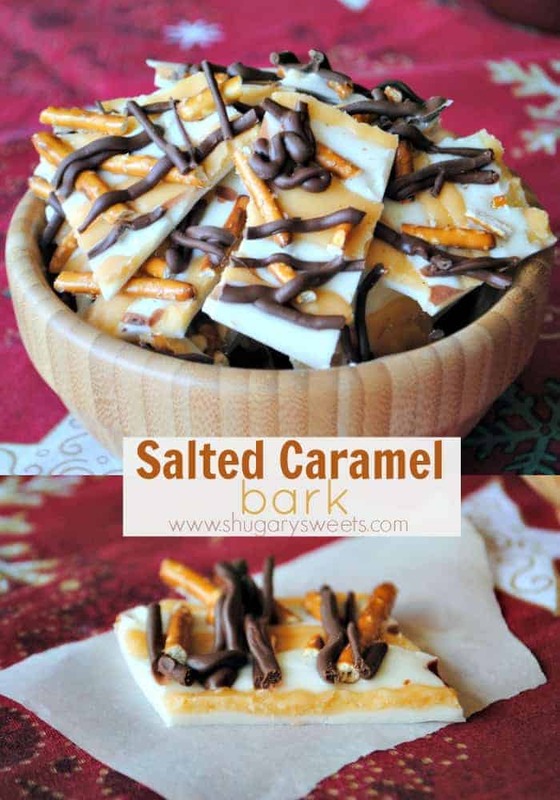 Which is why I made all of you some easy salted caramel bark. Now you too can make it at home and not feel guilty! It makes way more than the tub at Costco, and I imagine it costs less too! What a perfect addition this would make to your Holiday tray! Enjoy! In large saucepan melt butter. Add brown sugar and milk. Cook on medium for 2 minutes. Remove from heat and whisk in vanilla and powdered sugar. Set aside. Melt candy coating according to package directions. Pour on a parchment paper lined cookie sheet. Spread evenly. Drizzle caramel sauce over melted candy coating. Sprinkle with kosher salt. Top with broken pretzels (press them into bark, lightly). Melt milk chocolate according to package. Drizzle over bark. Allow to set about one hour. Oh.my.word! This looks amazing and I’m sure it tastes way better than Costco. Thanks for the friend request on Foodbuzz. I joined thru GoogleConnect. This looks SO good!!! I’m going to make some of this stuff to put in my Christmas sweet tins. Thanks! And, of course, keep some for our house. Looks and sounds great Aimee! ohmygosh girl! these are GORGEOUS!!! Thanks all, like Jocelyn said, time to put on the stretchy pants! oh my word. you made this with me in mind, right? Wow does this look yummy. A great food gift. Come visit us. We have pumpkin fried rice today. Be sure to stop by on Friday and register to win a party dress from The Shabby Apple. Pretzels on top = genius! These look divine! This looks amazing! Great for a holiday party or an edible gift! We just made a sweet & salty bark — so easy and I love the flavor combo. I love bark and I haven’t had it in so long! I’m going to break down and make some. Your bark with the pretzels is perfect! I love the salty sweet combo, I can’t get enough of it! This looks amazing! What a great gift idea or something decadent to enjoy over the holidays! What a great idea for gift giving, will be making some soon! Oh and found you over at Two Maids a Milking. I’m soooo making this. My husband will love me even more for doing so! These have been pinned!! Can’t wait to make them soon! Thanks for sharing on 2 Maids a Baking!!! 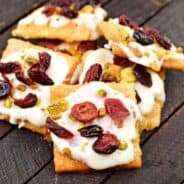 I am hosting a Holiday Cookie Recipe swap and would love to get the word out to other bloggers to post and share their recipe. I do get good traffic on my site so it would mean traffic for others. These look wonderful – I can eat these bars all day! Gotta say, if I could hire a personal confectioner, you’d be my first choice. Your desserts are always one of the highlights of my “A Little Birdie Visits” and this salted caramel bark is no exception. I’m featuring your post on my Facebook page today. delightful and very pretty treat. 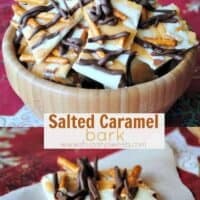 Salted Caramel Bark!? I’ll have 52 batches please. Not sure if you remember me, a friend of Kari’s. I check out your blog all the time, and I’m making these for my Sweet Swap at work tomorrow. Thanks for the great idea! I can’t wait to try them! 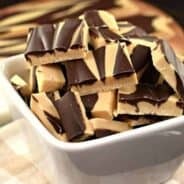 I make a toffee/graham based bark with different toppings. I’ve made a dark chocolate with sea salt and toffee bits, but I really like the idea of adding this topping to my graham cracker/toffee base! Might skip the pretzels though (I’m just not a pretzel fan). They look great. Where would i find the vanilla candy coating??? I find mine in any grocery store! It’s often times referred to as candiquik or vanilla bark. I go to Bulk Barn, they even carry gluten free candy coating. Thank you for sharing this recipe Aimee. I totally am with you on making my own goodies and such. Even some complicated goodies are made in my kitchen, simply because I know it will taste better and be cheaper! I run a home bakery and am always trying new things…so thanks again for sharing this recipe! This recipe would cover an entire cookie sheet?? What is vanilla candy coating? I live in Mexico, been here 7 years. I think I can get everything else, but I’m not familiar with that. Is it what we used to call “white chocolate” only it wasn’t? Thanks! as gifts. In the end the product worked with the other caramel and it looked and tasted great. Has any body else had problems with the caramel? What is vanilla candy coating ? It’s also known as Candiquik, Ghirhardelli melting wafers and vanilla almond bark. You can find it near the chocolate chips at most grocery stores. 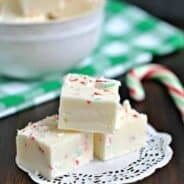 Pingback: Chocolate Bark Candy Recipes - Chocolate Chocolate and More! This was very easy to make, and tasted great too! But, on the next day the pretzels had lost their crunch. Any idea why they went soft? My chocolate broke off the first time too! Now, I wait to drizzle them with chocolate until I separate them into pieces. Hope this helps!